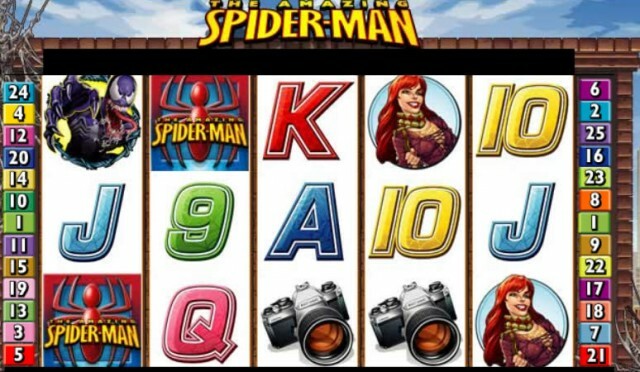 Spiderman is the latest addition to the range of Marvel slots at Cryptologic casinos, and we are pleased to confirm it’s one of the best slots yet! All the Marvel slots feature rich graphics, great sound, fantastic animations and bonus rounds, with the new Spiderman slot being no exception. Based on the original comic book and not the recent hit movie franchise, the slot displays all the great characteristics from great cartoon styling to the action packed animations. Spiderman slots review. This great looking 5 reel, 25 line slot has a whopping top prize of 25,000 coins, in addition to being part of the popular Marvel Jackpot series. The Spiderman slot is packed with realistic Spiderman symbols on the reels making it a very realistic gaming experience. But that is nothing compared to the two bonus round features available. The great thing about this when players spin three Spiderman logos, they have the chance to choose from one of two bonus rounds, giving total control over the game. First up is the Free Spins Bonus Round Feature, whereby players receive 15 free spins, and all winnings are multiplies with a neat x2 multiplier. There is always the chance to re-trigger more bonus rounds here so keep an eye out for more scatters. The second round is aptly named the “Venom Bonus” round and follows the story of when Spiderman must defeat his arch enemy Venom to protect his beloved Mary-Jane. The Venom bonus around involves guiding Spiderman through the streets and every time Spiderman wins a battle a bonus is awarded, and bonuses are rewarded continuously until he loses a battle. Again, this is a great looking bonus round which brings the slot to life and add this to the possibility of a big payout and you have a real winner on your hands. To complete this awesome Marvel based Slot, Spiderman features a four level progressive jackpot. The amazing component of this jackpot is that it is triggered randomly during game play: regardless of stake or even if a winning line is hit. Players are greeted with a 4×5 grid, in which they must match one of three progressive jackpot logos to reap the respective reward. This is a truly exciting round, as the chance to scoop the Ultimate Power Jackpot is always possible! Make sure you check out Spiderman and keep an eye on that massive jackpot as you will surely have an action packed time playing out the adventures of this Marvel hero. Intercasino Featuring Spiderman and all the Marvel Slots, Intercasino comes highly reccomended. Sky Vegas online casino has over 100 bonus slots including the Marvel slots and Spiderman.